Whether you grew up with a lakefront cabin or home in your family, or have spent weekends and holidays at resorts or friends’ homes “Up North,” it’s a common dream to wish for a lake house of your own. If you’re ready to start making fantastic memories involving early morning fishing trips, sandcastle building and sunset happy hours, follow these insights that will help you buy a lake home for the first time. Start by asking yourself why you are buying a waterfront house. The possibilities for waterfront fun are endless, and some properties or lakes may better suit your needs, says Edina Realty lakeshore home expert Jim Eisler. “Ask yourself, how do you intend to use the lake on an ideal weekend? Are you looking for water activities and a lake conducive to water skiing and wakeboarding? Do you envision long pontoon rides and the call of the loons? Do you fish for walleye, northern or the elusive muskie? These are the kinds of questions you want to ask and answer before you start your search,” says Eisler. It’s also important to keep in mind what is static and what can be modified when it comes to lakes and lakefront properties. “Elevation and lakeshore quality has been created by nature and cannot usually be changed or modified, but the waterfront structures generally can be — subject to zoning ordinances,” says Eisler. 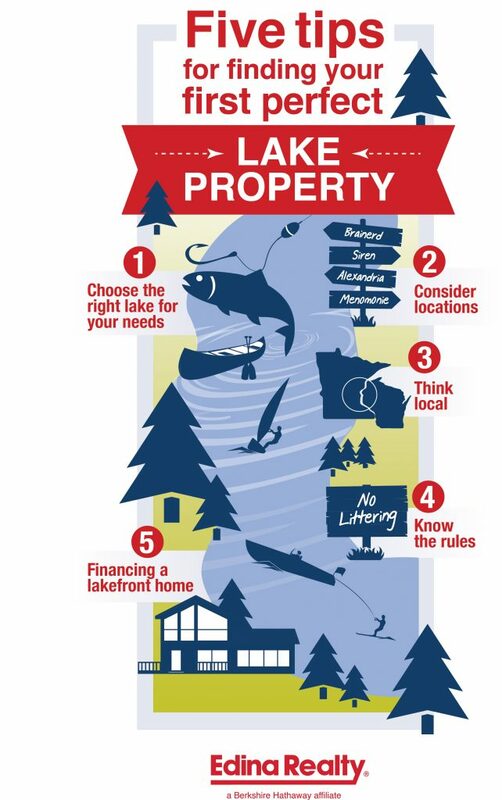 Once you’ve figured out the kind of lake property you want, it’s time to identify the best location for your new adventure. Start by considering your starting point for each trip — either your primary residence or your work. If you live and work in the eastern suburbs, for example, you may be interested in looking at lake homes in western Wisconsin. Burnett County is full of great properties, including in the popular vacation home towns of Siren and Spooner. Closer to the border, you may find you love St. Croix Valley riverfront homes. If you work in downtown Minneapolis, consider exploring the Brainerd area, which is just two short hours away. Alexandria, another popular area for lake cabins and homes, is also only two hours northwest of the metro area. Of course, when you have a fabulous lake home to retreat to on the weekends and holidays, any area can be the one you’ve been dreaming of. Whether you’ve settled on your desired lake home and its location or need a little help finding the right spot, get partnered with a lakeshore expert from one of Edina Realty’s 60 offices across Minnesota and western Wisconsin. We’ll ask the right questions so you can enjoy your new property for years to come. After all, we live here and we have spent years becoming bonafide lake experts. If you’re thinking of buying a waterfront home, we’d be remiss not to remind you that there are plenty of great bodies of water right where you live! Don’t forget to consider changing up your primary residence to be on a lake year-round. If you’re in the Twin Cities metro area, popular lakes for full-time living include Lake Minnetonka and the Minneapolis chain of lakes — Lake of the Isles, Bde Maka Ska (formerly Lake Calhoun) and Lake Harriet. Search lakeshore homes in any city in Minnesota or western Wisconsin. Water is, of course, one of our most precious natural resources, and it’s important that lake property owners take great care of the lake or river where they choose to live. In many cases, there are building ordinances that prevent homeowners from building near or on the shore. These ordinances are designed not only to protect the water and shoreline but can also help protect homeowners from building on waterfront land that may erode or destabilize over time. If you’re planning to build on an empty lake lot or to tear down an existing home and rebuild, you’ll want to consult with the local governmental authority to make sure you can build as you desire. A lakeshore expert from Edina Realty can help you draft an offer that gives you time to determine whether your plans will work and can even put you in touch with developers who specialize in a waterfront building. Want to learn about how the lake is being protected for the future before you buy a home or lot? See if the lake in question has an association that oversees the area. Many associations can give you the history of the lake and tell you how governing bodies like the county and DNR monitor the lake for clarity, fish, and safety. Whether you’re buying a waterfront primary home or a weekend lake cabin, you should connect with a mortgage loan officer early in the process. If you’ll be financing this property as a second home, you’ll work with your lender to determine if you are able to (and want to) use the equity from your primary residence to help pay for the down payment or closing costs of the new lake home. You will also have to disclose to the lender if you plan to use the property as a rental, which may impact your loan application and interest rate. READ: How to prepare for financing a second home. If you’re hoping to enjoy a waterfront property this summer, get started now so you have plenty of time for backyard barbecues, boat cruises and bonfires. Reach out today to get started on the process of buying a lake home, or start searching waterfront properties in Minnesota and western Wisconsin today. If you follow us on Twitter and Facebook, follow #BuyerInsights for more great tips on purchasing the right home for you and your family.